Taste test: For a Superman-branded product, this was quite disappointing. The granola bars in this box were mostly Rice Krispies and oats, with some small red and blue chocolate candies (each about the size of a Mini M&M) embedded inside. There was a nice close-up picture of a bar on the box, and it looked almost completely different from the actual bars inside. The picture showed lots of whole oats covering just about the whole outside of the bar, but the actual bar had some Rice Krispies visible, along with oats that were smashed up beyond recognition. The candy pieces were unbroken in the picture, but the real ones were in a majority of cases broken. 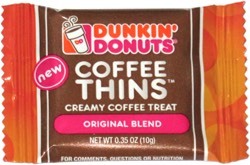 The taste was OK, but nothing great, as it was mostly just oats and Rice Krispies. 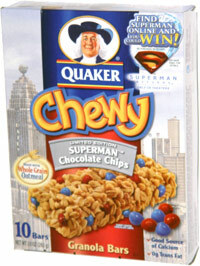 If Superman were to eat just these, I doubt he'd have much energy to be saving the world all the time. Smell test: Not much. Just a slight sweet smell.